Readers Question | Using Pink or Red Candles for Love Spell? Readers Question | Red or Pink Candle for Love Candle Spells? First let me say thank you for all the information you are giving here. I have learned so much! I am still confused on one thing. I read in the blog here that you suggest pink candles for love spells, but on many other places on the Internet, it says red candles for love candle spells? This is even in some websites that sells love candle kits already made up for you. What gives? You say one way, they say another. I am confused. Please help! Thank you for the compliments on the site – I try my best! Let me try to explain about candles and their color meaning in love candle spell work. If you remember in the Colonial days, candles were made from beef and mutton tallow, the fat scraped off the hide of cattle and sheep that was melted, had cotton string wicks dipped into it, and were the only source of light to early Americans (and others all over the world). This went on until the discovery of gas lamps and eventually, electricity. Tallow candles were one color – a creamy off-white. Anyone using candles for magical work usually oiled the candle and rolled them in ground herbs for the magical boost to the candle. There were no colored wax candles like we have today. In the history of colored candles for magical work, red was the oldest color associated with love. I remember when I was in my teens I had liked this boy. I got ahold of a love candle spell book and obtained the items required, including a red candle. I did my spell under the right Moon and WHAMMY – it worked! Only in the wrong way! He wanted me to take a Polaroid photo of myself naked and send it to him! This was in 1975, and that totally freaked me out! I got rid of him in a hurry! It scared me so that I did not do spell work for a very long time. Now, see that I used a red candle and what kind of attention I got from my target – sexual. I didn’t understand this for a long time until I started doing candle work like I do now. 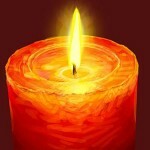 The energy of a red candle is INTENSE – which translates in our emotions as PHYSICAL DESIRE. So, thinking about Fast Luck Candle Spells, which use red candles, if the energy is intense and also resonates physical desire, how does this connect with Fast Luck? In my experiences, anything worth having is something you DESIRE – new car, home, great job, money in the bank , right? The wanting of am item is desire, like a lover or that one thing that will make that emotion satisfied. Red candles work when you do not want an emotional connection. They are your “wham bam, thank you, M’am” – type candles. They are all about the physical. Now, if this is the kind of relationship you want, because of distance apart, work demands, family, etc. – this is the right candle to use. Pink candles mix the passion of the red candle with the white of purity and peace. The energy of this candle is affectionate, playful, cuddly. Why do you think pink is probably the most favorite color of most little girls? Because it is non-threatening (passion and desire can be scary) and it is cuddly, like little girls. If getting into his (or her) mind, finding out their dreams, getting to know them as a person is something you want out of your relationship, then use pink candles. My most successful (an I can personally testify) pink candle spells is the Saint Jude Pink Love Candle Spell. C;ick on the blue words to read the post with the candle spell. Good Luck and thank you for a great question! There are two schools of thought. Old tyme root workers will say, ‘The relationship is in trouble. Light that candle NOW.’ while others will say,’Wait until the New Moon for success.’ Which one to choose? I have done both and ask my clients if they want it lit now or later. I do what they say, however, I feel personally, in cases of love, anytime is the best time. For money candles, begin on the New Moon.